If you love trivia, beer, pretzels and laughter come out for a relaxing fun filled night on the patio. 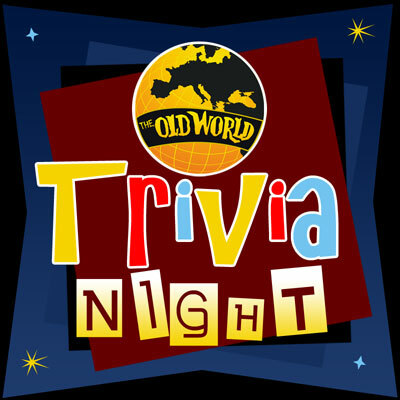 Old World Trivia is a free pub trivia contest modeled after those in Europe. Each person will participate in seven rounds of exciting trivia action with three questions per round. Questions will be general trivia so you don't have to be a know - it - all! To keep it unpredictable, hilarious host Kane Barber there will also serve up bonus questions in-between rounds. After the seven rounds are complete there will be a final question where participants will get to bid any or all of their remaining points in order to capture the victory. We will also have questions that will allow you to win prizes along the way. Come solo, or bring a group of friends. No matter what, you're guaranteed a fun-filled evening in a relaxing environment. Dog friendly patio! Drink and food specials galore!